When people think of barbecue ribs they think big slabs of meat thrown on a grill and slathered with sticky sweet sauce. Sometimes these ribs are boiled to make them fall off the bone, sometimes they are wrapped in foil to make them juicy, and sometimes they are just cooked on the grill and served with that pungent sugary sauce. I am here to share my story on the plight of the pork rib. There is only one acceptable way to cook pork ribs. Smoked. If you don’t have a smoker you can convert most grills to be smokers with a few minor modifications. I was fortunate enough to have been gifted a 22″ Weber Smokey Mountain on Father’s day 2012. Prior to owning a smoker I thought all barbecue was mediocre and something I tolerated at family functions. Even the best rated bbq joints in my town left me at a loss. I knew people raved about this stuff, but I couldn’t figure out why. Determined to find the secret behind this underground society of good barbecue I started reading blogs on the internet, looking over recipes, and seeing what other people were doing with their WSM’s. Then I gave it a shot. First attempt was destined to be a failure according to the bloggers, and they were right. I couldn’t maintain proper heat, ventilation, or smoke levels through the cooking process, and my rub left something to be desired. My second attempt was actually better than any bbq ribs I had ever had but wasn’t the magic bullet I was looking for. They were dry and not very tender but had a good rub. A little disappointed I gave up my endeavor for a while. My next eye opening experience was not my own cooking, but rather that of a small bbq joint on the north side of Portland, Oregon. I bit into the rib meat and I had one of the most wonderful foodie experiences of my life (second to discovering real ramen). 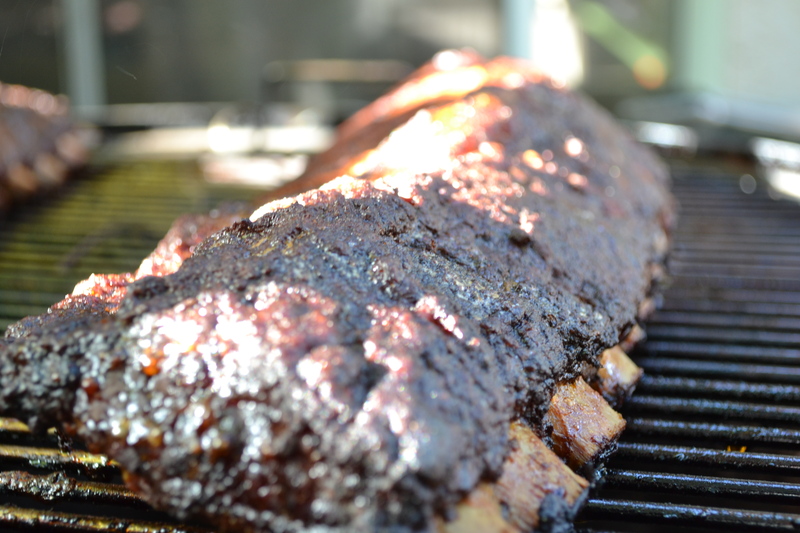 These ribs practically burst savory juices in my mouth as I bit down and the flavor was spectacular. I had found the near perfect rib. Time to try again at home. I don’t remember how many more trial and errors I had, but eventually I hit the jackpot; juicy, savory, tender, smoky, the stuff people rave about. The prep. It is a good idea to rinse the meat and give it a good rub down. Little bone fragments tend to stick to the meat after the butcher has done his thing. There is also a membrane on the back which must be removed. Take a small knife and score under this membrane until you can grasp it firmly. Then with a gentle yet firm pull, the membrane should come off in one piece. Now pat those racks dry, wash your hands thoroughly, and get your spices ready. The rub. When you have truly exceptional ribs, you don’t reach for the bbq sauce. In fact bbq sauce has never touched these ribs. All the extra flavor you need is built into the bark. The bark is the spice crust and the pellicle. The pellicle is a skin that is formed through a chemical reaction on the outside of the meat just under the rub. So what goes in the rub? The blogger’s choice seems to be Meathead’s Memphis Dust. The ingredients are brown sugar, white sugar, paprika, garlic powder, black pepper, ginger, onion powder, and rosemary. I try to substitute the brown and white sugar for turbinado sugar. The only other thing I find lacking in this recipe is salt. You should also add that one extra ingredient that makes the rub uniquely yours. In my example I traded the paprika for some homemade jalapeño powder on two of my ribs. This was a mistake. To my surprise, paprika is almost as key an ingredient as the sugar. Fortunately I did add the paprika for my third rack of ribs along with some ground fresh sage. Normally I put the rub on and let it sit overnight. 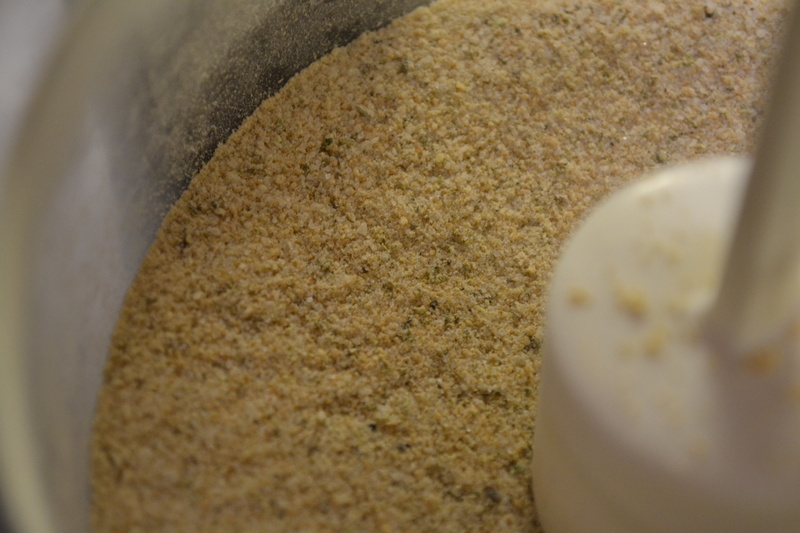 This allows for some osmosis and brings out enough liquid to wet the rub and dissolve some of the ingredients. For this smoke I didn’t have time to set them overnight. 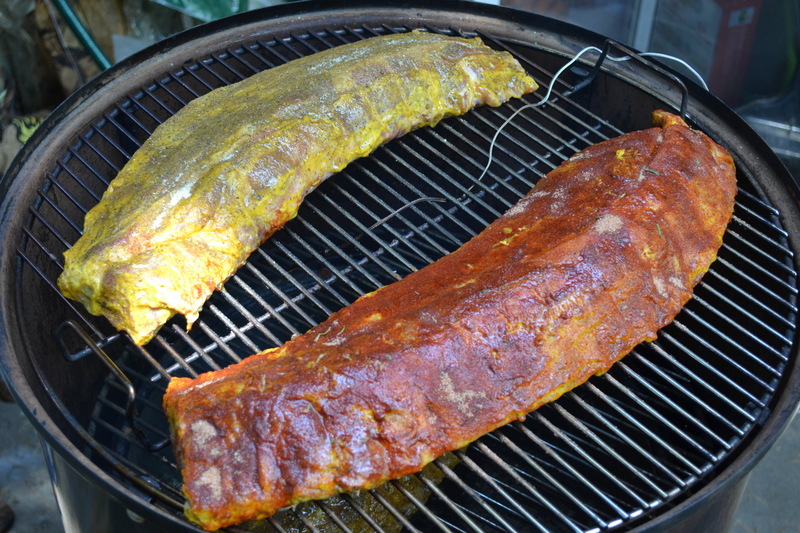 I coated the ribs in a thin layer of mustard. 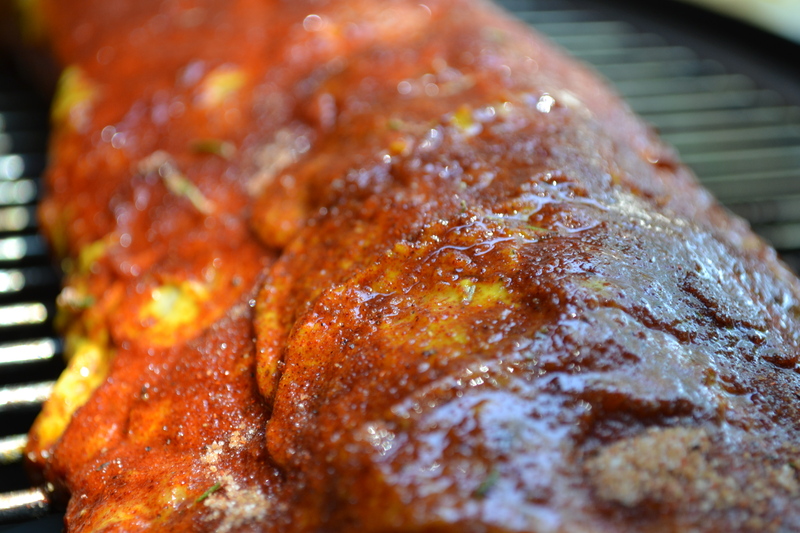 Instead of the natural juices of the meat, the vinegar in the mustard helps dissolve some of the rub’s components. Alternatively an oil can be used; some ingredients break down better in oil and some in vinegar. Either way you go will have a negligible outcome on the final flavor. The smoke. The WSM is a vertical water smoker. The water pan is said to keep the food moist as it cooks, but in reality its primary function is to stabilize the heat. 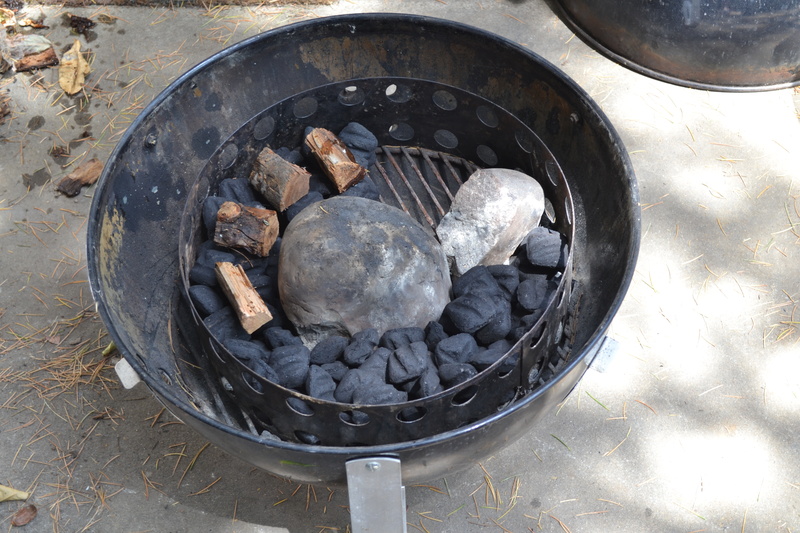 I also placed a large rock in the bottom for additional heat stabilization as well as a method to enable a longer burn on the charcoal. My goal is a cook time of 4-6 hours without opening the door to add more fuel (I have been able to get a 12 hour burn out of my smoker with this method for some amazing brisket). 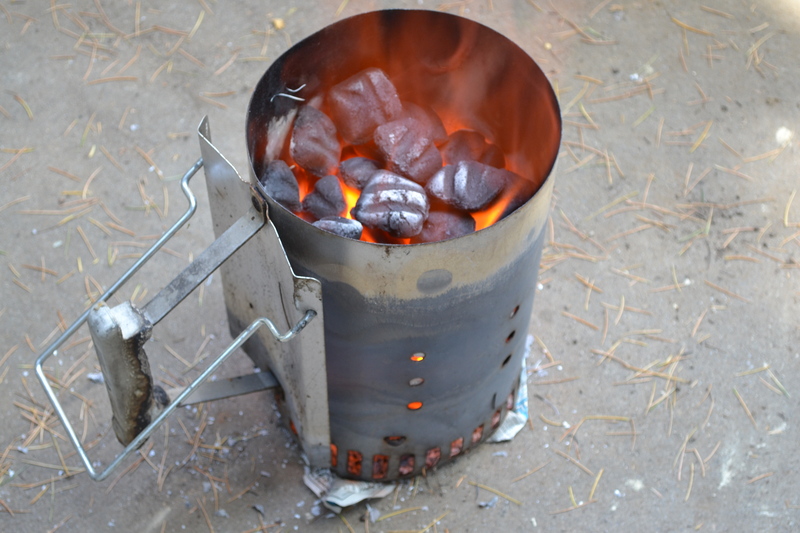 I add apple wood to the top of the charcoal so they release a constant smoke for the first hour or so in the cooking process. After the meat reaches a certain temperature, smoke will no longer have a chemical reaction with it, and no additional flavor will be retained. Besides, we are going for a light smoky flavor here, not a thick, just took a bite out of a campfire smoke flavor. It is imperative that the top vent remains open during the entire cooking process to provide proper ventilation. If the smoke sits in the cooking chamber, it becomes stagnant and will give the meat a bitter flavor. As for heat, we want to maintain a constant temperature between 225 and 250 Fahrenheit. The meat. Resist the urge to open the top and look at and/or probe the meat with a fork/thermometer/finger/other body part. The size of the rib will determine the cook time. 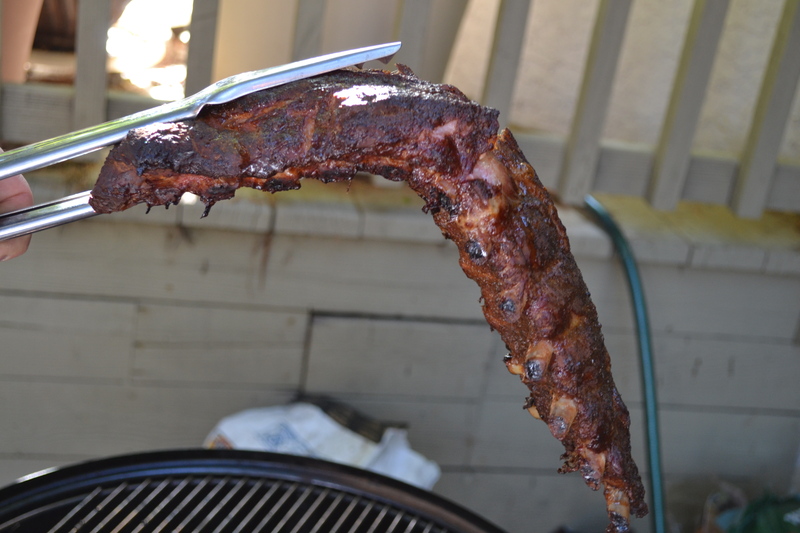 I use baby back ribs, and one of the three was rather large so I was shooting for 6 hours. I was rushed out of the house at 5 and a half hours and the large rack was barely done enough. An additional 30 minutes would have made them that much better. You can tell when they are done when the meat recedes from the bone and picking them up with tongs creates a 90 degree angle of meat. Pull them off and eat immediately! This entry was posted in Cooking at Home and tagged barbecue, bbq, grilling, jalapeño, pork ribs, smoked. Bookmark the permalink.